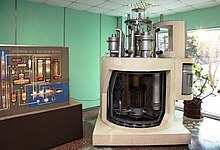 There is a lot of international interest in the fast-breeder reactor at Beloyarsk. Japan has its own prototype fast-breeder reactors. Japan paid 1 billion[clarification needed] for the technical documentation of the BN-600. The operation of the reactor is an international study in progress; Russia, France, Japan, and the United Kingdom currently participate. This page was last edited on 16 March 2019, at 02:26 (UTC).